After seeing the libretto, Tchaikovsky wrote a piece that was instrumental in turning around the ballet scene in Moscow. A problem with sets delayed its debut until January 15, 1890. Can You Guess the name of this famous piece? Excuse me now, it's time to take my nap. 1833 - Birth of German composer Johannes Brahms. 1883 - Opening of the Royal College of Music in London. 1919 - Birth of British violinist Emmanuel Hurwitz, leader of the Melos Ensemble. 1966 - Monday, Monday by the Mamas and the Papas tops the U.S. charts. 1994 - 1,332 guitarists joined rocker Randy Bachman as they played Takin' Care of Business for 68 minutes 40 seconds. World record for most guitarists gathered and the longest mass guitar jam. 1998 - Premiere of Joan Tower's Tambor, by the Pittsburgh Symphony, Mariss Jansons conducting. Pyotr Ilyich (Peter) Tchaikovsky was born May 7, 1840. He started piano lessons at age 5. Although he showed promise, he did not devote himself to music. He enrolled in the school of jurisprudence with the intent of studying law, and did not enter conservatory until 1863. He moved to Moscow 3 years later as professor of harmony at the new conservatory there. Although the conservative music establishment was not fond of his music, the public gave his First Symphony a good reception. 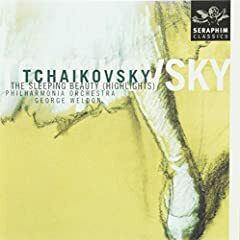 By 1874, Tchaikovsky had won acclaim with his Second Symphony, had composed two string quartets (the first the source of the famous Andante cantabile), most of his next opera, Vakula the Smith, and his First Piano Concerto. 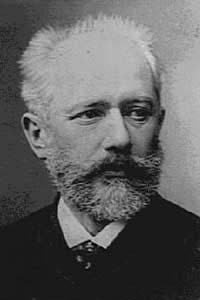 Tchaikovsky had originally intended for Nikolay Rubinstein, the head of Moscow Conservatory, who had encouraged him, but Rubinstein declared it to be unplayable. Tchaikovsky then dedicated to Hans von B�low (who gave its premiere, in Boston). Although Tchaikovsky composed many types of music, the piece that excites violinists is his Violin Concerto. Tchaikovsky was very fond of former student Yosif Kotek, a violinist of considerable skill, and set out to write a concerto to showcase his skills. Within eleven days of starting, Tchaikovsky had completely sketched out the work, but was displeased with the second movement. One day was all it took to replace that movement, then he set out to orchestrate the work. In all, the entire concerto was written over the course of just thirty days. Now it came time to premiere the work, but he needed a violinist of substantial stature to debut it, and his friend did not yet have that reputation. So Tchaikovsky chose to dedicate the work to the renowned soloist Leopold Auer. Auer said that the piece was "unviolinistic." Other violinists also turned Tchaikovsky down before he finally persuaded Adolph Brodsky to premiere the work in Vienna in December 4, 1881. "The Russian composer Tchaikovsky is surely not an ordinary talent, but rather an inflated one, with a genius-obsession without discrimination or taste. Such is also his latest, long and pretentious Violin Concerto. . . . (at) the end of the first movement. The violin is no longed played; it is beaten black and blue. The Adagio is again on its best behavior, to pacify and to win us. But it soon breaks off to make way for a finale that transfers us to a brutal and wretched jollity of a Russian holiday. We see plainly the savage vulgar faces, we hear curses, we smell vodka... Tchaikovsky's Violin Concerto gives us for the first time the hideous notion that there can be music that stinks to the ear." In time critics, the public and violinists themselves have come to love the piece. It is now a standard in most repertoires. In 1893 the composer wrote his Symphony no. 6 in B Minor, subsequently titled Path�tique by his brother Modeste. He conducted the piece in St. Petersburg on October 28, 1893. He died November 6, 1893 of cholera. January 15, 1890 the ballet Sleeping Beauty premiered. (Click here to read that story.) It was so popular that within 22 months it had already played 50 times in Russia. 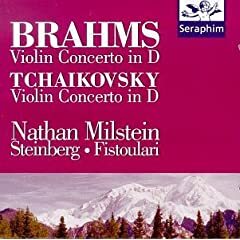 Milstein is Magnificent in the Tchaikovsky Violin Concerto, and at under $5 this CD is a Bargain! Download the Sheet Music for Tchaikovsky's Violin Concerto Direct to Your Computer. Fast. Convenient. Reasonable. Have You Seen the Alexa Toolbar? The world�s first toolbar is still the best. The Alexa Toolbar offers the unique ability to update in real-time to offer you information about the sites you visit. Foil the phishers and scammers with Alexa�s one-of-a-kind real-time site information. You won�t be fooled ever again! With Alexa�s patented real-time Related Links you will search less and find more on the Web. And the Pop-Up Blocker makes surfing much more pleasant! With a Violin Playing Smiley Face and the phrase Violinists Rule! right there on the bar, it's a Great Practice Reminder! Click the Image for More Information. Violinists Make Beautiful Music on the Diamond and in the Concert Hall!